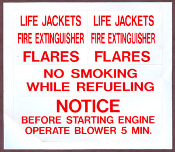 These vinyl labels from Bernard Engraving are great for marking the location of safety equipment, and providing extra safety reminders. Smaller labels are 1/2" tall x 2 1/4" wide. Larger labels are 1" and 1 1/2" tall and 4 1/2" wide.